DMV.com was created to help simplify your life by providing you with all the vehicle related information and Colorado DMV services you may need, in one place. Quickly find information and services regarding driving records, vehicle registration, drivers license renewal, license plate renewal, getting a learners permit, and finding a Colorado Department of Motor Vehicles approved traffic school. Submitting a drivers license application in CO is a DMV requirement for new drivers. Find more Colorado drivers license information here. Order your Colorado DMV driving history right from your computer. Ordering CO driving records online is the most convenient method to get them. Find the best car insurance rates using our convenient online car insurance center. The DOR requires Colorado drivers to have car insurance. A DMV driver improvement course can help you dismiss tickets and obtain insurance discounts. Learn more about CO traffic school benefits. A Colorado DMV practice test can help you prepare for the license test. Take a DMV practice exam to test your driving knowledge today. DMV vehicle registration in CO is required for car-owning residents. Learn about Colorado auto registration, including car registration renewal. Colorado drivers education is required for some first-time drivers. Enroll in online drivers ed to complete this DMV requirement from home. A Colorado bill of sale provides a record for your vehicle’s transfer of ownership. Learn to apply for a car bill of sale from the CO DOR. Learn how to pay traffic fines online in CO quickly and conveniently. Unpaid traffic tickets can result in penalties from the DOR. Driving under the influence (DUI) is taken seriously by the Colorado DOR. Learn about Colorado DUI laws and the state DUI consequences. Buy a used car or new car in Colorado without the hassle. Buying a car online can simplify your Colorado DMV registration process. Colorado DMV locations are right in your area. Check nearby CO DMV locations and hours to obtain the DMV services you need. Cut out DMV’s bureaucracy. DMV.com provides easy guides for drivers license, vehicle registration, license plate, emissions and other motor vehicle issues online. You don’t have to queue at the Colorado DMV office anymore. Now you can find all the vehicle related info fast and easy on our site. 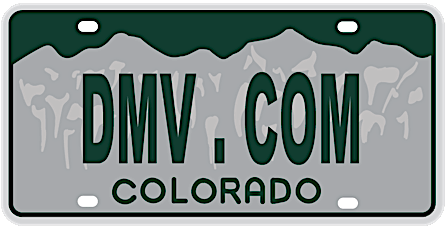 DMV.com will be your step-by-step guide to obtaining CO driver’s license, a vehicle registration or auto insurance, and it will help you meet any other Colorado BMV requirement. We are a private website that has nothing to do with any government agency, and thus we’re not stuck in government bureaucracy. Our job is to provide you with all the info related to possessing vehicle in a way that saves you both time and effort. Finding information on our web page is very simple.You can use the “search” bar or the navigation sections to navigate through our vast array of informative how-to articles. Lend us a helping hand by contributing to the site with your interaction. Comment on our pages, become our fan on Facebook and thus help us offer the most up-to-date information.